Fly the flag for Britain! These bags are unique in their class. 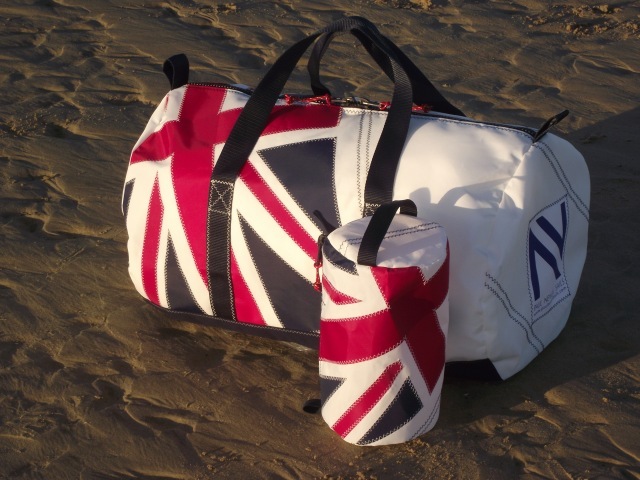 The bags are made from top quality heavy weight sailcloth in white and we add an extra layer of canvas to the base of the bag to add durability and protection to the sailcloth. Photos show the large kitbag with a wash bag and a medium and small duffle bag on the other two photos. 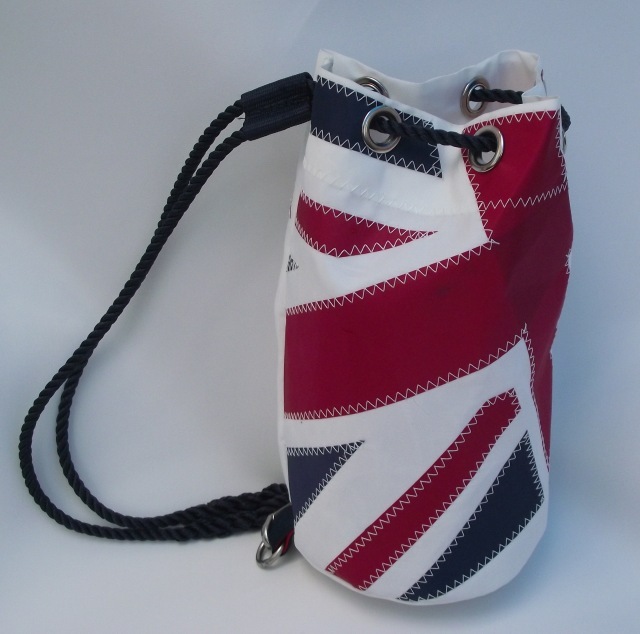 Each Union flag pattern is hand cut and sewn in place with traditional sailmakers zig zag stitch using UV resistant treated sailmakers thread. This thread is used throughout the bags. 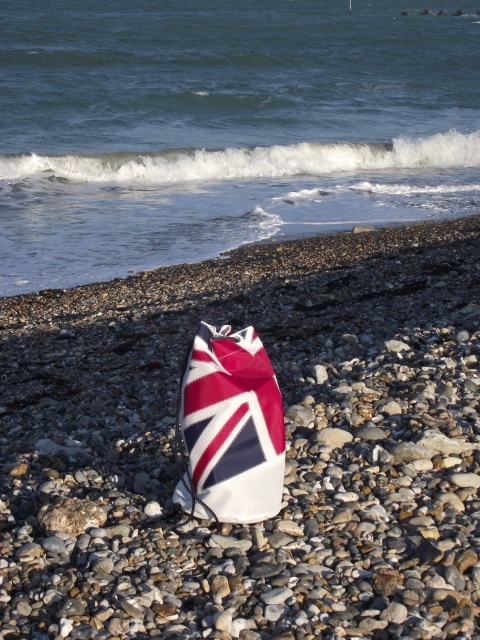 The flag is placed across the top of the bag and wraps around the bag, at a slight angle. The kit bags have Navy Blue webbing handles that go right around the bag and they too, are sewn on with white zigzag stitch. All of the kit bags have six large internal pockets. The wash bag has a webbing handle for carrying and hanging up the bag, however it does not have a canvas base. We add a large, chunky, robust, Navy Blue zip and slider which has a contrasting red pull cord. The large and extra large kit bag have two zip sliders to allow easy access at both ends of the bags. The small kit bag is ideal for taking to the gym or taking with you overnight. We add longer length handles that allow it to be worn on the shoulder, and it is popular with the girls. 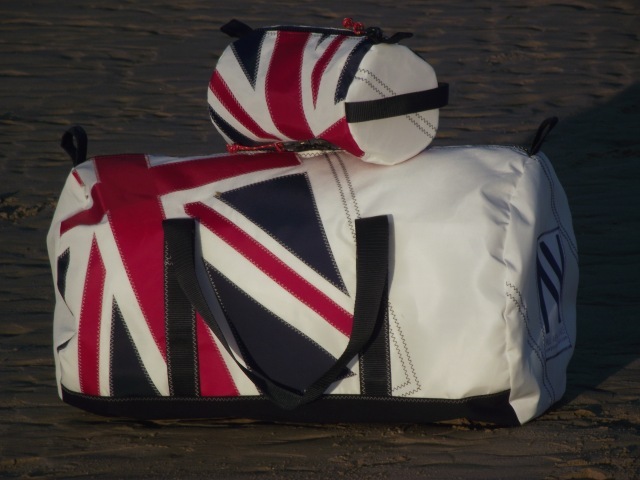 The medium size is a great bag for taking to sporting events or that well earned weekend away. The large size is great to take on your adventures into the blue. The extra large is a real family sized bag. Great for extended travelling or taking to University. The Duffle bags have eyelets around the top and a navy blue rope which is spliced onto a stainless steel clip. The base is white sail cloth. Care instructions: Wash by hand at 30 degrees centigrade with eco-friendly washing liquid. Shape and dry naturally. Do not add bleach, do not dry clean and do not tumble dry. Small Duffle Bag is 22cm diameter base x 40cm high. 12 litres approx. Medium Duffle Bag is 27cm diameter base x 50cm high. 23 litres approx. Large Duffle Bag is 33cm diameter base x 60cm high. 41 litres approx. Wash bag: 26cm length x 15cm diameter. 4.5 litres approx. LargeLong: 70cm length x 38cm diameter. 80 litres approx. Extra Large 70cm length x 42cm diameter. 111 litres approx.